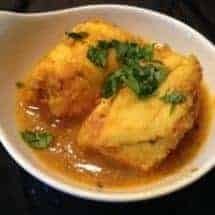 Fish Masala Curry | A Delightful Indian Seafood Dish You're Sure To Love! As many of you know, I’m not a professional cook so there’s a lot of trial and error going on for me. One of the hardest things since being sleeved, is knowing how much to cook and getting the proportions right. I struggle with this, and this Fish Masala Curry recipe is a classic example of it. You’ll note that I made twice as much of the “masala” as I should have. Since the masala is the most time-consuming part of this recipe, and since it keeps very well, I thought I’d leave the recipe as is and let you save half the masala as I did. Tomorrow, I will show you how to re-purpose that into something else. So here it goes. While the rest of your family might enjoy this over rice, we gave ourselves two pieces of fish and a little sauce. Then we shredded the fish and ate it semi-moist. It was moist, but not soupy and therefore not a slider. REALLY BOOST THE TASTE OF THIS DISH BY USING MY CLASSIC PUNJABI GARAM MASALA RECIPE INSTEAD OF STORE BOUGHT GARAM MASALA! 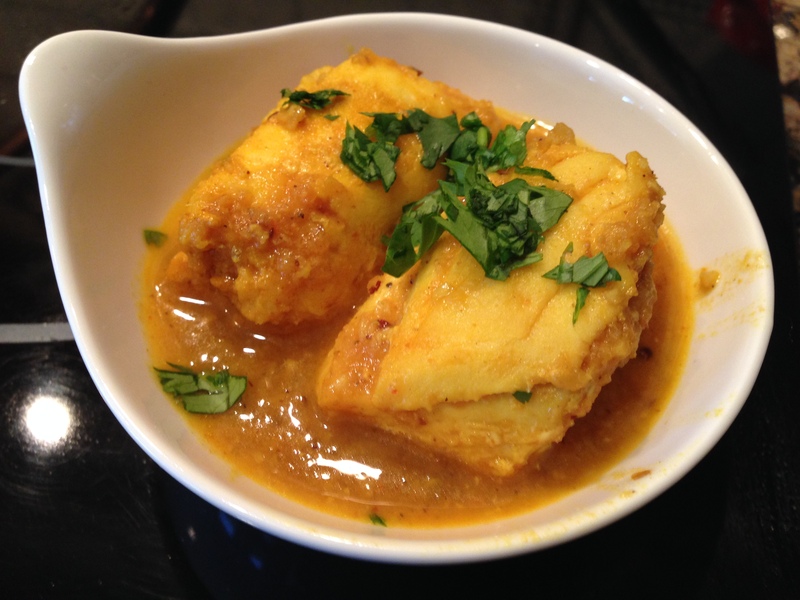 Fish Masala Curry is a delightful Indian seafood dish that you're sure to love! And best of all it's low carb, high in protein and paleo! Marinate the fish with 1 teaspoon oil, 1 teaspoon turmeric and 1/4 teaspoons salt. Meanwhile, pulse the onion, garlic and ginger in a food processor or chop finely. Do not liquefy. Heat 2 teaspoons oil in a pan. When it starts to shimmer, put in the mustard and cumin seeds and let them sputter. This sounds like popcorn popping. Add in the onion/garlic/ginger mix and cook over medium heat. This is a labor of love so do not rush it. It may take 10 minute and that's just the way it goes. Add in the chopped tomatoes, all of the rest of the spices and the coconut and mix well. Add in half a cup of water and let it cook slowly, until all the water has evaporated. Realize that you have no idea how to make small quantities. Take out half the masala and save it in a tupperware container. Into the remaining masala, add in half a cup of water, and the fish that has been marinating. Cover and let it come to a boil. When it boils, take it off the heat and let it sit for 10 minutes so that the fish cooks gently. This keeps it from over-cooking. Tell you what, when you’re only able to eat 2-4 ounce at a time, it’s really difficult to make the right amount of food! I wish we loved left-overs but we can eat them for one day, but that’s about our limit.